You visit the eye doctor to check your eyesight, right? That's only part of the reason to visit our optometrist in Maple Ridge. There two types of eye health we're concerned with: the way your eyes work and how healthy they are. Each item requires a different type of eye test. At Maple Ridge Eye Care, we combine the two into a comprehensive eye health examination. Most people connect an eye exam with the need for eye glasses. The beginning of any eye examination is a vision test, which starts with the traditional image on the wall with letters of decreasing size. You'll look through a machine called a refractor/phoropter, which looks like an elaborate oversize set of glasses. While you focus on the wall and its letters, our eye doctor will switch lenses through which you can see. By comparing pairs of lenses with each other, the doctor can determine the right prescription for your eyeglasses or contact lenses. If you decide to wear contact lenses instead of eyeglasses, we'll need to take additional measurements by shining lights into your eyes. This will determine the size and curvature of your eyeballs, so that you get the right size of contact lens for your eyes. Whether you wear contact lenses or glasses, the result of a successful vision examination is a patient with vision that's corrected to normal. Checking for a new eyeglass prescription is only the beginning of a comprehensive eye examination. 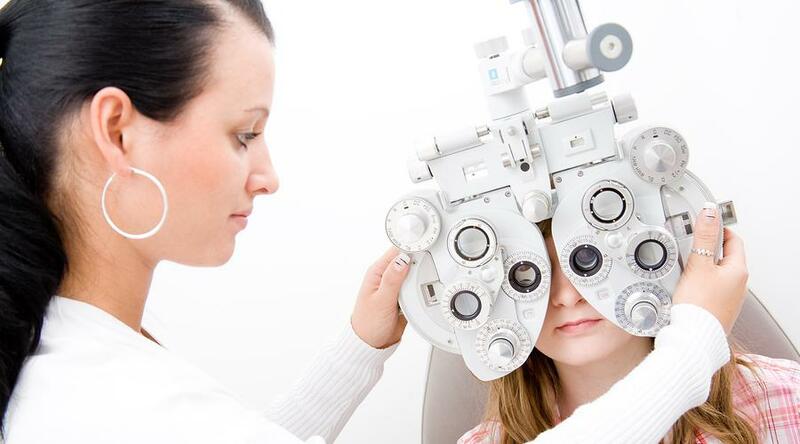 To make an appointment with our optometrist in Maple Ridge, call 604-463-4469 today.